Satellite photograph of the Southern Rocky Mountains of the United States. The Southern Rocky Mountains are a major subregion of the Rocky Mountains of North America located in the southeastern portion of the U.S. state of Wyoming, the central and western portions of Colorado, the northern portion of New Mexico, and extreme eastern portions of Utah. The Southern Rocky Mountains are also commonly known as the Southern Rockies, and since the highest peaks are located in the State of Colorado, they are sometimes known as the Colorado Rockies, although many important ranges and peaks rise in the other three states. The Southern Rockies include the highest mountain ranges of the Rocky Mountains and include all 30 of the highest major peaks of the Rockies. The Southern Rocky Mountains are generally divided from the Western Rocky Mountains by the Green River and the Colorado River below the Green River. The Southern Rockies are divided from the Central Rocky Mountains by South Pass in Wyoming and the drainage running east from the pass down the Sweetwater River and the North Platte River; and the drainage running southwest from the pass down Pacific Creek and Sandy Creek to the Green River. This divide between the Southern Rockies and the Central Rockies provided the lowest elevation traverse of the Rocky Mountain region for the historic Oregon Trail, the Mormon Trail, and the California Trail. The southern end of the Rocky Mountains are considered to be the Jemez Mountains and the Southern Sangre De Cristo mountains of New Mexico. Mountains south of here in N.M. are classified as the Arizona/New Mexico Mountains using the EPA Level III Ecoregions System. This article defines a significant summit as a summit with at least 100 meters (328.1 feet) of topographic prominence, and a major summit as a summit with at least 500 meters (1640.4 feet) of topographic prominence. An ultra-prominent summit is a summit with at least 1500 meters (4921.3 feet) of topographic prominence. All elevations in this article include an elevation adjustment from the National Geodetic Vertical Datum of 1929 ( NGVD 29) to the North American Vertical Datum of 1988 ( NAVD 88). For further information, please see this United States National Geodetic Survey note. The following table lists the mountain ranges and subranges of the Southern Rocky Mountains with their highest summit. The following sortable table lists the 57 mountain peaks of the Southern Rocky Mountains with at least 4,000 meters (13,123.4 ft) of topographic elevation and at least 500 meters (1,640.4 ft) of topographic prominence. The following sortable table lists the 15 most topographically isolated peaks of the Southern Rocky Mountains with a topographic isolation of at least 50 kilometers (31.07 mi) and a topographic prominence of at least 500 meters (1,640.4 ft). The following sortable table lists progressively the easternmost Rocky Mountain summits of their respective elevation. View from Independence Pass in Colorado. View from Red Mountain Pass in Colorado. The following sortable table lists the paved mountain passes and highway summits of the Southern Rocky Mountains. Mount Elbert in the Sawatch Range of Colorado is the highest peak of the Rocky Mountains. 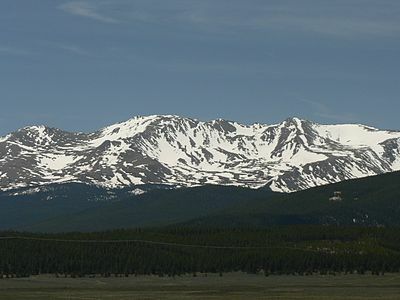 Mount Massive in the Sawatch Range is the second highest peak of the Rocky Mountains. Mount Harvard is the highest of the Collegiate Peaks and the third highest peak of the Rocky Mountains. La Plata Peak in the Collegiate Peaks is the fifth highest peak of the Rocky Mountains. Blanca Peak is the highest peak of the Sangre de Cristo Mountains and the second most topographically isolated peak of the Southern Rocky Mountains. Uncompahgre Peak is the highest peak of the San Juan Mountains and the sixth highest peak of the Rocky Mountains. Crestone Peak is the highest peak of the Crestones and the seventh highest peak of the Rocky Mountains. Mount Lincoln is the highest peak of the Mosquito Range and the eighth highest peak of the Rocky Mountains. Castle Peak is the highest peak of the Elk Mountains and the ninth highest peak of the Rocky Mountains. 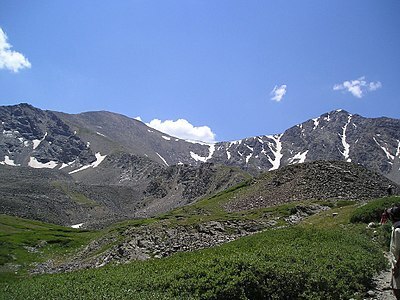 Grays Peak is the highest peak of the Front Range and the tenth highest peak of the Rocky Mountains. Longs Peak is a prominent mountain in Colorado's Front Range. It is the northernmost "fourteener" in the Rocky Mountains. Pikes Peak is the second most topographically prominent mountain peak of the Southern Rocky Mountains. 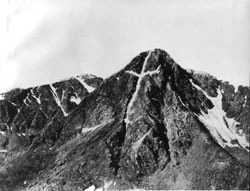 This photograph of the legendary Mount of the Holy Cross was taken by William Henry Jackson in 1874. Wheeler Peak in the Taos Mountains is the highest point of the State of New Mexico. Mount Peale in the La Sal Mountains dominates east-central Utah. Medicine Bow Peak in the Snowy Range is the highest point of both southern and eastern Wyoming. ^ "Sawatch Range". Mountain Ranges of the World. peakbagger.com. Retrieved March 9, 2012. ^ "Elbert Massif". Mountain Ranges of the World. peakbagger.com. Retrieved March 9, 2012. ^ a b c d e The summit of Mount Elbert is the highest point of the Rocky Mountains and the State of Colorado. ^ a b c d e "Mount Elbert". Datasheet for NGS Station KL0637. U.S. National Geodetic Survey. Retrieved March 13, 2012. Cite error: Invalid <ref> tag; name "D_Mount Elbert" defined multiple times with different content (see the help page). ^ a b c d e The elevation of Mount Elbert includes an adjustment of + m (6.55 ft) from NGVD 29 to NAVD 88. ^ a b c d e "Mount Elbert". Peakbagger.com. Retrieved March 13, 2012. Cite error: Invalid <ref> tag; name "I_Mount Elbert" defined multiple times with different content (see the help page). ^ "Massive Massif". Mountain Ranges of the World. peakbagger.com. Retrieved March 9, 2012. ^ a b Mount Massive the second highest peak of the Rocky Mountains. ^ a b "Mount Massive". Datasheet for NGS Station KL0640. U.S. National Geodetic Survey. Retrieved March 13, 2012. ^ a b The elevation of Mount Massive includes an adjustment of + m (6.84 ft) from NGVD 29 to NAVD 88. ^ a b "Mount Massive". Peakbagger.com. Retrieved March 13, 2012. ^ "Collegiate Peaks". Mountain Ranges of the World. peakbagger.com. Retrieved March 9, 2012. ^ a b c The summit of Mount Harvard is the highest point of the Collegiate Peaks. ^ a b c "Mount Harvard". Datasheet for NGS Station JL0879. U.S. National Geodetic Survey. Retrieved March 13, 2012. Cite error: Invalid <ref> tag; name "D_Mount Harvard" defined multiple times with different content (see the help page). ^ a b c The elevation of Mount Harvard includes an adjustment of + m (6.84 ft) from NGVD 29 to NAVD 88. ^ a b c "Mount Harvard". Peakbagger.com. Retrieved March 13, 2012. Cite error: Invalid <ref> tag; name "I_Mount Harvard" defined multiple times with different content (see the help page). ^ "Williams Mountains". Mountain Ranges of the World. peakbagger.com. Retrieved March 16, 2013. ^ a b The summit of Bill Williams Peak is the highest point of the Williams Mountains. ^ a b The elevation of Bill Williams Peak includes an adjustment of + m (6.71 ft) from NGVD 29 to NAVD 88. ^ a b "Bill Williams Peak". Peakbagger.com. Retrieved March 16, 2013. ^ "Southern Sawatch Range". Mountain Ranges of the World. peakbagger.com. Retrieved March 9, 2012. ^ a b The summit of Mount Antero is the highest point of the southern Sawatch Range. ^ a b "Mount Antero". Datasheet for NGS Station JL0883. U.S. National Geodetic Survey. Retrieved March 13, 2012. ^ a b The elevation of Mount Antero includes an adjustment of + m (6.8 ft) from NGVD 29 to NAVD 88. ^ a b "Mount Antero". Peakbagger.com. Retrieved March 13, 2012. ^ "Far Southern Sawatch Range". Mountain Ranges of the World. peakbagger.com. Retrieved March 9, 2012. ^ a b The summit of Mount Ouray is the highest point of the far southern Sawatch Range. ^ a b "Mount Ouray". Datasheet for NGS Station JL0672. U.S. National Geodetic Survey. Retrieved March 13, 2012. ^ a b The elevation of Mount Ouray includes an adjustment of + m (6.14 ft) from NGVD 29 to NAVD 88. ^ a b "Mount Ouray". Peakbagger.com. Retrieved March 13, 2012. ^ "Northern Sawatch Range". Mountain Ranges of the World. peakbagger.com. Retrieved March 9, 2012. ^ a b The summit of Mount of the Holy Cross is the highest point of the northern Sawatch Range. ^ a b "Mount of the Holy Cross". Datasheet for NGS Station KL0649. U.S. National Geodetic Survey. Retrieved March 13, 2012. ^ a b The summit elevation of Mount of the Holy Cross includes a vertical offset of + m (2 ft) from the station benchmark. ^ a b The elevation of Mount of the Holy Cross includes an adjustment of + m (6.32 ft) from NGVD 29 to NAVD 88. ^ a b "Mount of the Holy Cross". Peakbagger.com. Retrieved March 13, 2012. ^ "Sangre de Cristo Mountains". Mountain Ranges of the World. peakbagger.com. Retrieved March 9, 2012. ^ "Sierra Blanca Massif". Mountain Ranges of the World. peakbagger.com. Retrieved March 9, 2012. ^ a b c d e The summit of Blanca Peak is the highest point of the Sierra Blanca Massif and the Sangre de Cristo Range. Cite error: Invalid <ref> tag; name "A_Blanca Peak" defined multiple times with different content (see the help page). Cite error: Invalid <ref> tag; name "A_Blanca Peak" defined multiple times with different content (see the help page). Cite error: Invalid <ref> tag; name "A_Blanca Peak" defined multiple times with different content (see the help page). Cite error: Invalid <ref> tag; name "A_Blanca Peak" defined multiple times with different content (see the help page). ^ a b c d e The elevation of Blanca Peak includes an adjustment of + m (5.76 ft) from NGVD 29 to NAVD 88. ^ a b c d e "Blanca Peak". Peakbagger.com. Retrieved March 13, 2012. Cite error: Invalid <ref> tag; name "I_Blanca Peak" defined multiple times with different content (see the help page). ^ "Northern Sangre de Cristo Range". Mountain Ranges of the World. peakbagger.com. Retrieved March 9, 2012. ^ "Crestones". Mountain Ranges of the World. peakbagger.com. Retrieved March 9, 2012. ^ a b The summit of Crestone Peak is the highest point of the northern Sangre de Cristo Range. 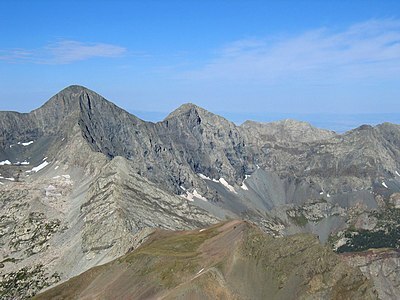 ^ a b The elevation of Crestone Peak includes an adjustment of + m (5.77 ft) from NGVD 29 to NAVD 88. ^ a b "Crestone Peak". Peakbagger.com. Retrieved March 13, 2012. ^ The elevation of Rito Alto Peak includes an adjustment of + m (5.93 ft) from NGVD 29 to NAVD 88. ^ "Rito Alto Peak". Peakbagger.com. Retrieved March 13, 2012. ^ "Culebra Range". Mountain Ranges of the World. peakbagger.com. Retrieved March 9, 2012. ^ a b c The summit of Culebra Peak is the highest point of the Culebra Range. ^ a b c The elevation of Culebra Peak includes an adjustment of + m (5.71 ft) from NGVD 29 to NAVD 88. ^ a b c "Culebra Peak". Peakbagger.com. Retrieved March 13, 2012. ^ "Spanish Peaks". Mountain Ranges of the World. peakbagger.com. Retrieved March 9, 2012. ^ a b The summit of West Spanish Peak is the highest point of the Spanish Peaks and the easternmost 4000 meter (13,123-foot) summit of the United States. ^ a b c The elevation of West Spanish Peak includes an adjustment of + m (4.82 ft) from NGVD 29 to NAVD 88. ^ a b c "West Spanish Peak". Peakbagger.com. Retrieved March 13, 2012. Cite error: Invalid <ref> tag; name "I_West Spanish Peak" defined multiple times with different content (see the help page). ^ "Taos Mountains". Mountain Ranges of the World. peakbagger.com. Retrieved March 9, 2012. ^ a b c The summit of Wheeler Peak is the highest point of the Taos Mountains and the State of New Mexico. ^ a b c "Wheeler Peak". Datasheet for NGS Station GM0779. U.S. National Geodetic Survey. Retrieved March 13, 2012. ^ a b c The elevation of Wheeler Peak includes an adjustment of + m (5.35 ft) from NGVD 29 to NAVD 88. ^ a b c "Wheeler Peak". Peakbagger.com. Retrieved March 13, 2012. ^ "Santa Fe Mountains". Mountain Ranges of the World. peakbagger.com. Retrieved March 9, 2012. ^ a b The summit of Truchas Peak is the highest point of the Santa Fe Mountains. ^ a b "Truchas Peak". Datasheet for NGS Station FN0666. U.S. National Geodetic Survey. Retrieved March 13, 2012. ^ a b The elevation of Truchas Peak includes an adjustment of + m (4.85 ft) from NGVD 29 to NAVD 88. ^ a b "Truchas Peak". Peakbagger.com. Retrieved March 13, 2012. ^ "Cimarron Range". Mountain Ranges of the World. peakbagger.com. Retrieved March 9, 2012. 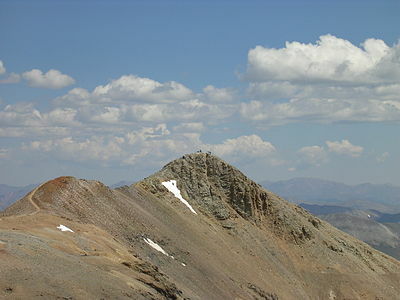 ^ The summit of Baldy Mountain is the highest point of the Cimarron Range. ^ "Baldy Mountain". Datasheet for NGS Station GM0775. U.S. National Geodetic Survey. Retrieved March 13, 2012. ^ The elevation of Baldy Mountain includes an adjustment of + m (4.54 ft) from NGVD 29 to NAVD 88. ^ "Baldy Mountain". Peakbagger.com. Retrieved March 13, 2012. ^ "Wet Mountains". Mountain Ranges of the World. peakbagger.com. Retrieved March 9, 2012. ^ The summit of Greenhorn Mountain is the highest point of the Wet Mountains. ^ "Greenhorn Mountain". Datasheet for NGS Station HK0512. U.S. National Geodetic Survey. Retrieved March 13, 2012. ^ The elevation of Greenhorn Mountain includes an adjustment of + m (4.6 ft) from NGVD 29 to NAVD 88. ^ "Greenhorn Mountain". Peakbagger.com. Retrieved March 13, 2012. ^ "Southern Sangre de Cristo Range". Mountain Ranges of the World. peakbagger.com. Retrieved March 9, 2012. ^ The summit of Cerro Vista is the highest point of the southern Sangre de Cristo Range. ^ "Cerro Vista". Datasheet for NGS Station GM0798. U.S. National Geodetic Survey. Retrieved March 13, 2012. ^ The elevation of Cerro Vista includes an adjustment of + m (4.73 ft) from NGVD 29 to NAVD 88. ^ "Cerro Vista". Peakbagger.com. Retrieved March 13, 2012. ^ "San Juan Mountains". Mountain Ranges of the World. peakbagger.com. Retrieved March 9, 2012. ^ "North Central San Juan Mountains". Mountain Ranges of the World. peakbagger.com. Retrieved March 9, 2012. 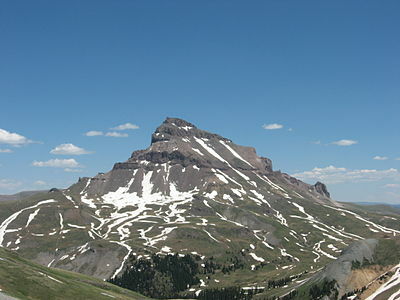 ^ a b c The summit of Uncompahgre Peak is the highest point of the San Juan Mountains. ^ a b c "Uncompahgre Peak". Datasheet for NGS Station JL0798. U.S. National Geodetic Survey. Retrieved March 13, 2012. ^ a b c The elevation of Uncompahgre Peak includes an adjustment of + m (6.45 ft) from NGVD 29 to NAVD 88. ^ a b c "Uncompahgre Peak". Peakbagger.com. Retrieved March 13, 2012. ^ "San Miguel Mountains". Mountain Ranges of the World. peakbagger.com. Retrieved March 9, 2012. ^ a b c The summit of Mount Wilson is the highest point of the San Miguel Mountains. ^ a b c The elevation of Mount Wilson includes an adjustment of + m (6.23 ft) from NGVD 29 to NAVD 88. ^ a b c "Mount Wilson". Peakbagger.com. Retrieved March 13, 2012. ^ "Sneffels Range". Mountain Ranges of the World. peakbagger.com. Retrieved March 9, 2012. ^ a b The summit of Mount Sneffels is the highest point of the Sneffels Range. ^ a b "Mount Sneffels". Datasheet for NGS Station JL0826. U.S. National Geodetic Survey. Retrieved March 13, 2012. ^ a b The elevation of Mount Sneffels includes an adjustment of + m (6.16 ft) from NGVD 29 to NAVD 88. ^ a b "Mount Sneffels". Peakbagger.com. Retrieved March 13, 2012. ^ "Needle Mountains". Mountain Ranges of the World. peakbagger.com. Retrieved March 16, 2013. ^ a b The summit of Mount Eolus is the highest point of the Needle Mountains. ^ a b The elevation of Mount Eolus includes an adjustment of + m (5.76 ft) from NGVD 29 to NAVD 88. ^ a b "Mount Eolus". Peakbagger.com. Retrieved March 13, 2012. ^ "Grenadier Range". Mountain Ranges of the World. peakbagger.com. Retrieved March 9, 2012. ^ The summit of Vestal Peak is the highest point of the Grenadier Range. ^ The elevation of Vestal Peak includes an adjustment of + m (5.84 ft) from NGVD 29 to NAVD 88. ^ "Vestal Peak". Peakbagger.com. Retrieved March 13, 2012. ^ "West Needle Mountains". Mountain Ranges of the World. peakbagger.com. Retrieved March 9, 2012. ^ a b The summit of Twilight Peak is the highest point of the West Needle Mountains. ^ a b The elevation of Twilight Peak includes an adjustment of + m (5.04 ft) from NGVD 29 to NAVD 88. ^ a b "Twilight Peak". Peakbagger.com. Retrieved March 13, 2012. ^ "La Garita Mountains". Mountain Ranges of the World. peakbagger.com. Retrieved March 9, 2012. ^ a b The summit of San Luis Peak is the highest point of the La Garita Mountains. ^ a b "San Luis Peak". Datasheet for NGS Station HL0570. U.S. National Geodetic Survey. Retrieved March 13, 2012. ^ a b The elevation of San Luis Peak includes an adjustment of + m (6.88 ft) from NGVD 29 to NAVD 88. ^ a b "San Luis Peak". Peakbagger.com. Retrieved March 13, 2012. ^ "Long Branch Baldy". Datasheet for NGS Station JL0682. U.S. National Geodetic Survey. Retrieved March 13, 2012. ^ "East Central San Juan Mountains". Mountain Ranges of the World. peakbagger.com. Retrieved March 9, 2012. ^ The elevation of Half Peak includes an adjustment of + m (6.56 ft) from NGVD 29 to NAVD 88. ^ "Half Peak". Peakbagger.com. Retrieved March 13, 2012. ^ "Southern San Juan Mountains". Mountain Ranges of the World. peakbagger.com. Retrieved March 9, 2012. ^ a b c The summit of Summit Peak is the highest point of the southern San Juan Mountains. ^ a b c "Summit Peak". Datasheet for NGS Station HL0503. U.S. National Geodetic Survey. Retrieved March 13, 2012. ^ a b c The elevation of Summit Peak includes an adjustment of + m (6.16 ft) from NGVD 29 to NAVD 88. ^ a b c "Summit Peak". Peakbagger.com. Retrieved March 13, 2012. ^ "La Plata Mountains". Mountain Ranges of the World. peakbagger.com. Retrieved March 9, 2012. ^ "Hesperus Mountain". Peakbagger.com. Retrieved March 13, 2012. ^ "Tusas Mountains". Mountain Ranges of the World. peakbagger.com. Retrieved March 9, 2012. ^ The summit of Grouse Mesa is the highest point of the Tusas Mountains. ^ The elevation of Grouse Mesa includes an adjustment of + m (5.34 ft) from NGVD 29 to NAVD 88. ^ "Grouse Mesa". Peakbagger.com. Retrieved March 13, 2012. ^ "Mosquito Range". Mountain Ranges of the World. peakbagger.com. ^ a b The summit of Mount Lincoln is the highest point of the Mosquito Range. ^ a b "Mount Lincoln". Datasheet for NGS Station KL0627. U.S. National Geodetic Survey. Retrieved March 13, 2012. ^ a b The elevation of Mount Lincoln includes an adjustment of + m (6.88 ft) from NGVD 29 to NAVD 88. ^ a b "Mount Lincoln". Peakbagger.com. Retrieved March 13, 2012. ^ "Tenmile Range". Mountain Ranges of the World. peakbagger.com. Retrieved March 9, 2012. ^ The summit of Quandary Peak is the highest point of the Tenmile Range. ^ "Quandary Peak". Datasheet for NGS Station KL0622. U.S. National Geodetic Survey. Retrieved March 13, 2012. ^ The elevation of Quandary Peak includes an adjustment of + m (6.79 ft) from NGVD 29 to NAVD 88. ^ "Quandary Peak". Peakbagger.com. Retrieved March 13, 2012. ^ "Front Range". Mountain Ranges of the World. peakbagger.com. Retrieved March 9, 2012. ^ "Central Front Range". Mountain Ranges of the World. peakbagger.com. Retrieved March 9, 2012. ^ a b The summit of Grays Peak is the highest point of the Front Range and the Continental Divide of North America. ^ a b "Grays Peak". Datasheet for NGS Station KK2036. U.S. National Geodetic Survey. Retrieved March 13, 2012. ^ a b The elevation of Grays Peak includes an adjustment of + m (6.17 ft) from NGVD 29 to NAVD 88. ^ a b "Grays Peak". Peakbagger.com. Retrieved March 13, 2012. ^ a b "Mount Evans". Datasheet for NGS Station KK2030. U.S. National Geodetic Survey. Retrieved March 13, 2012. ^ a b The summit elevation of Mount Evans includes a vertical offset of + m (5.9 ft) from the station benchmark. ^ a b The elevation of Mount Evans includes an adjustment of + m (5.99 ft) from NGVD 29 to NAVD 88. ^ a b "Mount Evans". Peakbagger.com. Retrieved March 13, 2012. ^ "Northern Front Range". Mountain Ranges of the World. peakbagger.com. Retrieved March 9, 2012. ^ "Longs Peak Massif". Mountain Ranges of the World. peakbagger.com. Retrieved March 9, 2012. ^ a b c The summit of Longs Peak is the highest point of the northern Front Range. ^ a b c "Longs Peak". Datasheet for NGS Station LL1346. U.S. National Geodetic Survey. Retrieved March 13, 2012. 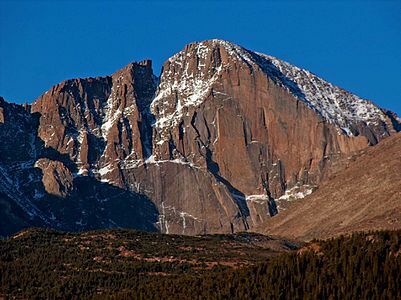 ^ a b c The elevation of Longs Peak includes an adjustment of + m (5.42 ft) from NGVD 29 to NAVD 88. ^ a b c "Longs Peak". Peakbagger.com. Retrieved March 13, 2012. ^ "Mummy Range". Mountain Ranges of the World. peakbagger.com. Retrieved March 9, 2012. ^ a b The summit of Hagues Peak is the highest point of the Mummy Range. ^ a b "Hagues Peak". Datasheet for NGS Station LL1350. U.S. National Geodetic Survey. Retrieved March 13, 2012. ^ a b The elevation of Hagues Peak includes an adjustment of + m (5.64 ft) from NGVD 29 to NAVD 88. ^ a b "Hagues Peak". Peakbagger.com. Retrieved March 13, 2012. ^ "Indian Peaks". Mountain Ranges of the World. peakbagger.com. Retrieved March 9, 2012. ^ a b The summit of North Arapaho Peak is the highest point of the Indian Peaks. ^ a b "North Arapaho Peak". Datasheet for NGS Station LL1357. U.S. National Geodetic Survey. Retrieved March 13, 2012. ^ a b The elevation of North Arapaho Peak includes an adjustment of + m (5.78 ft) from NGVD 29 to NAVD 88. ^ a b "North Arapaho Peak". Peakbagger.com. Retrieved March 13, 2012. ^ "Never Summer Mountains". Mountain Ranges of the World. peakbagger.com. Retrieved March 9, 2012. ^ The summit of Mount Richthofen is the highest point of the Never Summer Mountains. ^ The elevation of Mount Richthofen includes an adjustment of + m (5.44 ft) from NGVD 29 to NAVD 88. ^ "Mount Richthofen". Peakbagger.com. Retrieved March 13, 2012. ^ a b c d The summit of Pikes Peak is the highest point of the southern Front Range. ^ a b c d e "Pikes Peak". Datasheet for NGS Station JK1242. U.S. National Geodetic Survey. Retrieved March 13, 2012. Cite error: Invalid <ref> tag; name "D_Pikes Peak" defined multiple times with different content (see the help page). ^ a b c d e The elevation of Pikes Peak includes an adjustment of + m (5.51 ft) from NGVD 29 to NAVD 88. ^ a b c d e "Pikes Peak". Peakbagger.com. Retrieved March 13, 2012. Cite error: Invalid <ref> tag; name "I_Pikes Peak" defined multiple times with different content (see the help page). ^ "South Park Hills". Mountain Ranges of the World. peakbagger.com. Retrieved March 9, 2012. ^ The summit of Waugh Mountain is the highest point of the South Park Hills. ^ The elevation of Waugh Mountain includes an adjustment of + m (5.58 ft) from NGVD 29 to NAVD 88. ^ "Waugh Mountain". Peakbagger.com. Retrieved March 13, 2012. ^ "Rampart Range". Mountain Ranges of the World. peakbagger.com. Retrieved March 9, 2012. ^ The summit of Devils Head is the highest point of the Rampart Range. ^ "Devils Head". Datasheet for NGS Station KK1932. U.S. National Geodetic Survey. Retrieved March 13, 2012. ^ The elevation of Devils Head includes an adjustment of + m (4.06 ft) from NGVD 29 to NAVD 88. ^ "Devils Head". Peakbagger.com. Retrieved March 13, 2012. ^ "South Williams Fork Mountains". Mountain Ranges of the World. peakbagger.com. Retrieved March 9, 2012. ^ The summit of Ptarmigan Peak is the highest point of the South Williams Fork Mountains. ^ The elevation of Ptarmigan Peak includes an adjustment of + m (5.87 ft) from NGVD 29 to NAVD 88. ^ "Ptarmigan Peak". Peakbagger.com. Retrieved March 13, 2012. ^ "Tarryall Mountains". Mountain Ranges of the World. peakbagger.com. Retrieved March 9, 2012. ^ The summit of Bison Peak is the highest point of the Tarryall Mountains. ^ "Bison Peak". Datasheet for NGS Station KK1966. U.S. National Geodetic Survey. Retrieved March 13, 2012. ^ The elevation of Bison Peak includes an adjustment of + m (5.33 ft) from NGVD 29 to NAVD 88. ^ "Bison Peak". Peakbagger.com. Retrieved March 13, 2012. ^ "Kenosha Mountains". Mountain Ranges of the World. peakbagger.com. Retrieved March 9, 2012. ^ The summit of Knobby Crest is the highest point of the Kenosha Mountains. ^ The elevation of Knobby Crest includes an adjustment of + m (5.23 ft) from NGVD 29 to NAVD 88. ^ "Knobby Crest". Peakbagger.com. Retrieved March 13, 2012. ^ "Elk Mountains". Mountain Ranges of the World. peakbagger.com. Retrieved March 9, 2012. ^ a b The summit of Castle Peak is the highest point of the Elk Mountains. ^ a b "Castle Peak". Datasheet for NGS Station KL0659. U.S. National Geodetic Survey. Retrieved March 13, 2012. ^ a b The elevation of Castle Peak includes an adjustment of + m (7.1 ft) from NGVD 29 to NAVD 88. ^ a b "Castle Peak". Peakbagger.com. Retrieved March 13, 2012. ^ The summit of Mount Owen is the highest point of the Ruby Range. ^ "Mount Owen". Datasheet for NGS Station JL0737. U.S. National Geodetic Survey. Retrieved March 13, 2012. ^ The elevation of Mount Owen includes an adjustment of + m (6.53 ft) from NGVD 29 to NAVD 88. ^ "Mount Owen". Peakbagger.com. Retrieved March 13, 2012. ^ "West Elk Mountains". Mountain Ranges of the World. peakbagger.com. Retrieved March 9, 2012. ^ The summit of West Elk Peak is the highest point of the West Elk Mountains. ^ "West Elk Peak". Datasheet for NGS Station JL0755. U.S. National Geodetic Survey. Retrieved March 13, 2012. ^ The elevation of West Elk Peak includes an adjustment of + m (6.91 ft) from NGVD 29 to NAVD 88. ^ "West Elk Peak". Peakbagger.com. Retrieved March 13, 2012. ^ "Gore Range". Mountain Ranges of the World. peakbagger.com. Retrieved March 9, 2012. ^ a b The summit of Mount Powell is the highest point of the Gore Range. ^ a b The elevation of Mount Powell includes an adjustment of + m (5.81 ft) from NGVD 29 to NAVD 88. ^ a b "Mount Powell". Peakbagger.com. Retrieved March 13, 2012. ^ "Medicine Bow Mountains". Mountain Ranges of the World. peakbagger.com. Retrieved March 9, 2012. 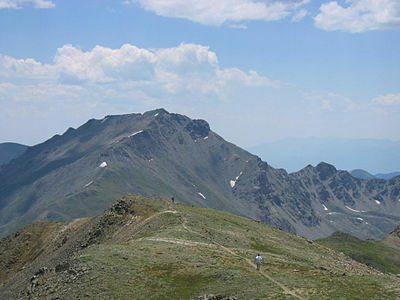 ^ The summit of Clark Peak is the highest point of the Medicine Box Mountains. ^ "Clark Peak". Datasheet for NGS Station LL1388. U.S. National Geodetic Survey. Retrieved March 13, 2012. ^ The elevation of Clark Peak includes an adjustment of + m (5.34 ft) from NGVD 29 to NAVD 88. ^ "Clark Peak". Peakbagger.com. Retrieved March 13, 2012. ^ "Snowy Range". Mountain Ranges of the World. peakbagger.com. Retrieved March 9, 2012. ^ a b The summit of Medicine Bow Peak is the highest point of the Snowy Range. ^ a b "Medicine Bow Peak". Datasheet for NGS Station MP0546. U.S. National Geodetic Survey. Retrieved March 13, 2012. ^ a b The elevation of Medicine Bow Peak includes an adjustment of + m (4.9 ft) from NGVD 29 to NAVD 88. ^ a b "Medicine Bow Peak". Peakbagger.com. Retrieved March 13, 2012. ^ "La Sal Mountains". Mountain Ranges of the World. peakbagger.com. Retrieved March 9, 2012. ^ a b The summit of Mount Peale is the highest point of the La Sal Mountains. ^ a b "Mount Peale". Datasheet for NGS Station JM0496. U.S. National Geodetic Survey. Retrieved March 13, 2012. ^ a b The elevation of Mount Peale includes an adjustment of + m (4.95 ft) from NGVD 29 to NAVD 88. ^ a b "Mount Peale". Peakbagger.com. Retrieved March 13, 2012. ^ "Flat Tops (Colorado)". Mountain Ranges of the World. peakbagger.com. Retrieved March 9, 2012. ^ a b The summit of Flat Top Mountain is the highest point of the Flat Tops. ^ a b "Flat Top Mountain". Datasheet for NGS Station LM0694. U.S. National Geodetic Survey. Retrieved March 13, 2012. ^ a b The elevation of Flat Top Mountain includes an adjustment of + m (5.57 ft) from NGVD 29 to NAVD 88. ^ a b "Flat Top Mountain". Peakbagger.com. Retrieved March 13, 2012. ^ "Rabbit Ears Range". Mountain Ranges of the World. peakbagger.com. Retrieved March 9, 2012. ^ The summit of Parkview Mountain is the highest point of the Rabbit Ears Range. ^ "Parkview Mountain". Datasheet for NGS Station LM0574. U.S. National Geodetic Survey. Retrieved March 13, 2012. ^ The elevation of Parkview Mountain includes an adjustment of + m (5.21 ft) from NGVD 29 to NAVD 88. ^ "Parkview Mountain". Peakbagger.com. Retrieved March 13, 2012. ^ "Park Range". Mountain Ranges of the World. peakbagger.com. Retrieved March 9, 2012. ^ "Central Park Range". Mountain Ranges of the World. peakbagger.com. Retrieved March 9, 2012. ^ a b The summit of Mount Zirkel is the highest point of the Park Range. ^ a b The elevation of Mount Zirkel includes an adjustment of + m (5.35 ft) from NGVD 29 to NAVD 88. ^ a b "Mount Zirkel". Peakbagger.com. Retrieved March 13, 2012. ^ "Elkhead Mountains". Mountain Ranges of the World. peakbagger.com. Retrieved March 9, 2012. ^ The summit of Sand Mountain North is the highest point of the Elkhead Mountains. ^ The elevation of Sand Mountain North includes an adjustment of + m (4.96 ft) from NGVD 29 to NAVD 88. ^ "White River Plateau". Mountain Ranges of the World. peakbagger.com. Retrieved March 9, 2012. ^ The summit of Blair Mountain is the highest point of the White River Plateau. ^ The elevation of Blair Mountain includes an adjustment of + m (5.13 ft) from NGVD 29 to NAVD 88. ^ "Blair Mountain". Peakbagger.com. Retrieved March 13, 2012. ^ "Grand Mesa". Mountain Ranges of the World. peakbagger.com. Retrieved March 9, 2012. ^ The summit of Crater Peak is the highest point of Grand Mesa. ^ "Crater Peak". Datasheet for NGS Station KL0706. U.S. National Geodetic Survey. Retrieved March 13, 2012. ^ The elevation of Crater Peak includes an adjustment of + m (5.74 ft) from NGVD 29 to NAVD 88. ^ "Crater Peak". Peakbagger.com. Retrieved March 13, 2012. ^ "Laramie Mountains". Mountain Ranges of the World. peakbagger.com. Retrieved March 9, 2012. ^ The summit of South Bald Mountain is the highest point of the Laramie Mountains. ^ "South Bald Mountain". Datasheet for NGS Station LL1377. U.S. National Geodetic Survey. Retrieved March 13, 2012. ^ The elevation of South Bald Mountain includes an adjustment of + m (4.68 ft) from NGVD 29 to NAVD 88. ^ "South Bald Mountain". Peakbagger.com. Retrieved March 13, 2012. ^ "Uncompahgre Plateau". Mountain Ranges of the World. peakbagger.com. Retrieved March 9, 2012. ^ The summit of Horsefly Peak is the highest point of the Uncompahgre Plateau. ^ "Horsefly Peak". Datasheet for NGS Station JL0830. U.S. National Geodetic Survey. Retrieved March 13, 2012. ^ The elevation of Horsefly Peak includes an adjustment of + m (5.19 ft) from NGVD 29 to NAVD 88. ^ "Horsefly Peak". Peakbagger.com. Retrieved March 13, 2012. ^ "Ute Mountain". Mountain Ranges of the World. peakbagger.com. Retrieved March 9, 2012. ^ The summit of Ute Peak is the highest point of Ute Mountain. ^ "Ute Peak". Datasheet for NGS Station HM0511. U.S. National Geodetic Survey. Retrieved March 13, 2012. ^ The elevation of Ute Peak includes an adjustment of + m (3.74 ft) from NGVD 29 to NAVD 88. ^ "Ute Peak". Peakbagger.com. Retrieved March 13, 2012. ^ "Raton Mesa". Mountain Ranges of the World. peakbagger.com. Retrieved March 9, 2012. ^ a b c The summit of Fishers Peak is the highest point of Raton Mesa and the High Plains. Cite error: Invalid <ref> tag; name "A_Fishers Peak" defined multiple times with different content (see the help page). Cite error: Invalid <ref> tag; name "A_Fishers Peak" defined multiple times with different content (see the help page). ^ a b c "Fishers Peak". Datasheet for NGS Station HK0441. U.S. National Geodetic Survey. Retrieved March 13, 2012. Cite error: Invalid <ref> tag; name "D_Fishers Peak" defined multiple times with different content (see the help page). ^ a b c The elevation of Fishers Peak includes an adjustment of + m (3.76 ft) from NGVD 29 to NAVD 88. ^ a b c "Fishers Peak". Peakbagger.com. Retrieved March 13, 2012. Cite error: Invalid <ref> tag; name "I_Fishers Peak" defined multiple times with different content (see the help page). ^ East Spanish Peak the easternmost 3800 meter (12,467.2-foot) summit of Northern America. ^ "East Spanish Peak". Datasheet for NGS Station HK0488. U.S. National Geodetic Survey. Retrieved April 24, 2012. ^ The elevation of East Spanish Peak includes an adjustment of + m (4.5 ft) from NGVD 29 to NAVD 88. ^ "East Spanish Peak". Peakbagger.com. Retrieved April 24, 2012. ^ West Spanish Peak the easternmost 4000 meter (13,123.4-foot) summit of Northern America. ^ Pikes Peak is the easternmost 14,000-foot (4267.2 m) summit of Northern America. Pikes Peak was the inspiration for the lyrics of America the Beautiful". ^ The state highway up Mount Evans ends about a quarter mile (400 m) from the summit. The Mount Evans Scenic Byway is the highest paved highway in North America. ^ a b c d e This highway is closed during the winter. ^ The toll road up Pikes Peak ends at the summit of the mountain. Pikes Peak is the most visited mountain summit in North America. ^ a b Trail Ridge Road ( U.S. Highway Route 34) crosses the Continental Divide at Milner Pass but reaches its highest point several miles northeast of the pass. Trail Ridge Road is the highest paved through highway in North America. ^ a b c d e f g h i j k l m n o p This pass lies on the Continental Divide of the Americas. ^ The highest elevation in the Eisenhower Tunnel is a short distance inside the West Portal. The tunnel passes under the Continental Divide a few miles west of Loveland Pass. The Eisenhower Tunnel is the highest elevation on the Interstate Highway System of the United States. ^ The high point near Warrior Mountain is the highest point on Colorado State Highway 103. ^ Happy Jack Summit is the highest point on I-80. ^ Raton Pass was the highest point on the historic Santa Fe Trail, and now is the highest point on I-25. ^ South Pass was the highest point on the historic Oregon Trail, the Mormon Trail, and the California Trail.